30th Arrival Tortola & settle onto the boat; final provisioning, evening ashore in Road Town at the fabulous 'Dove' Restaurant. 31st Sail to Peter Island and then on to Norman Island for a private dinner and New Year celebration, OR on to Jost Van Dyke for some serious partying! 1st A quiet day lazing around the boat, sailing to Little Thatch or Guana Island for some snorkelling. Barbeque dinner. 2nd Sail to Cane Garden Bay with some time to explore ashore. Dinner in the lively Mayett's Restaurant watching the moon over the bay. 3rd Sail to Marina Cay where you can snorkel the reef in crystal clear water or swim ashore for some Pusser's Rum. 4th Sail to the Dogs for more great reef action and on to Gorda Sound and the Bitter End Yacht Club for dinner. 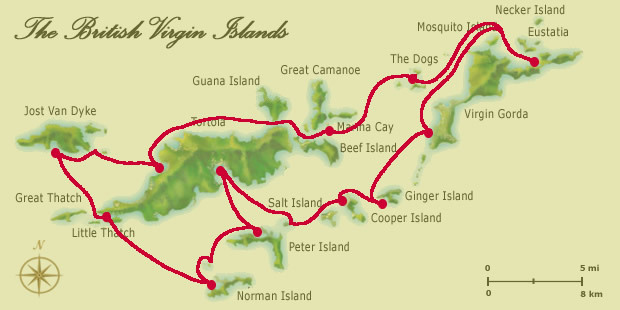 5th Sail North to Richard Branson's prestigious Necker Island and the quiet beaches of Anegada or South for the remarkable area known as the Baths on Virgin Gorda. 6th A day spent swimming and snorkelling in the beautiful bays of Virgin Gorda and Ginger Island. 7th A final day at the snorkelling spots and either a barbeque on board or sail back to Tortola for dinner ashore. 8th Sail back to Tortola or some souvenir hunting and say your goodbyes.. Fancy doing something completely different this year? Celebrate your New Year in the Caribbean! If you've not seen the sun very much this year or you've been cooped up in the office too much, beat the winter weather and do something extraordinary to bring in the New Year 2011! What better way to spoil yourself with some quality time sailing between the beautiful white sand beaches and secluded anchorages of the British Virgin Islands on your own private yacht? Lots of Watersports - Perfect for active adventure seekers! Our 10 day New Year Holiday 2010-11 itinerary takes in all the highlights of the British Virgin Islands and gives you plenty of glorious sunshine sailing, great home-cooked food, fantastic snorkelling and as much or as little partying as you want. Diving trips can also be arranged in the protected BVI National Marine Park and you'll have plenty of time for relaxing and exploring by foot or by kayak. Take a break from all the catering! Our trip includes all of your meals on board, some evening meals too, with a special New Year's Eve dinner to your taste. Then party the New Year in at the famous "Foxy's" on Jost Van Dyke. Need a bit more time? Why not combine your stay with our Christmas in St Martin, St Barth's & Anguilla? Or extend your trip to leave up to a week later and have extra time lazing on deck or with a longer sail back to St Martin for some extra beach time. Note that we can arrange pickup at other islands within a 60nm radius. There may be an additional charge. The following websites are the local country / island tourist websites with lots of information on things to do and more pictures to whet your appetite!